Unlike 2010, 2011 wasn’t a year of breakout campaigns, products or brands on a magnitude of the iPad or the Old Spice Guy. Yet, marketing as we know it continued to evolve in significant ways. 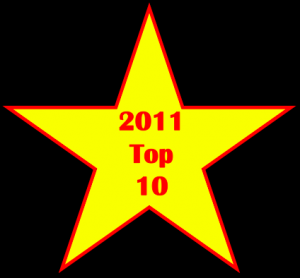 Here are the top ten marketing highlights of 2011 for your consideration as you finalize your 2012 marketing. Individually, each point may not seem significant, but viewed together they represent a dynamic change in how the public uses technology and consumes content. Consumers have changed their shopping behavior. Shoppers now buy based on need not desire. As a result, impulse purchases are less likely. Further, they’re more likely to purchase based on price instead of brand, especially where there’s no visible difference. Actionable Marketing Tip: Focus on the basics, especially having the best product your target market wants. Since buyers are well informed and do research at every step of the buying process, provide information they find useful, including product reviews, or they’ll look elsewhere. Also, provide your best price via mobile when they’re ready to buy and checking last minute prices before paying since they’ll buy elsewhere if the price is right – without even leaving your store. 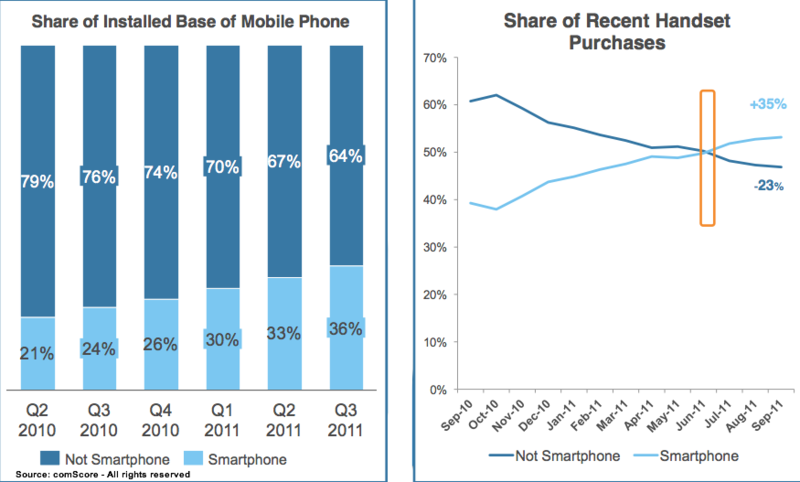 Smartphone ownership drives expanded mobile use. 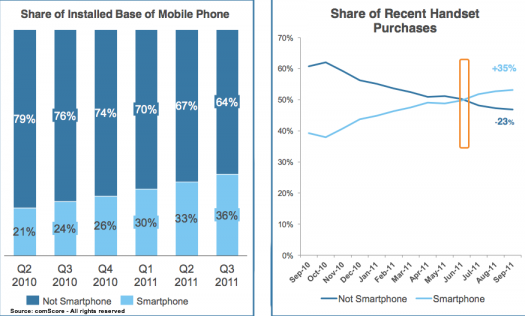 Smartphones reached a tipping point in 2011. Always within arm’s reach, smartphones are used during consumers’ waking hours and support a range of activities regardless of where owners are. Actionable Marketing Tip: Take a page from local marketers. At a minimum, create a mobile website focused on users’ main mobile activity, be present on mobile search, and ensure email is mobile-friendly. Social media usage continues to expand. While there was lots of activity in the social media sphere, there were no great new campaigns. Google introduced its latest social media entrant, Google+. 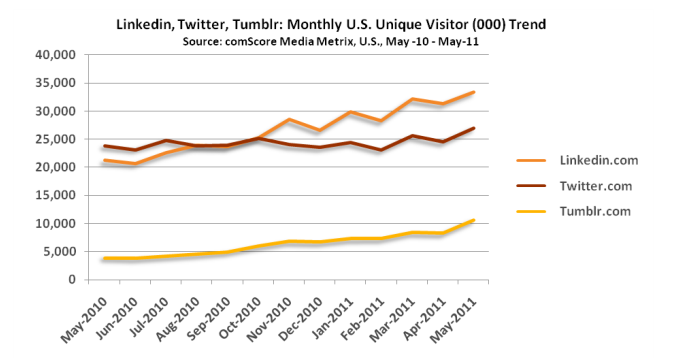 It was the biggest social media event of 2011 growing a record-breaking rate. Meanwhile Facebook changed to meet the challenge and remained the 900 pound gorilla of social media. YouTube, the number two search engine and social media platform behind Facebook, rolled out new analytics. With its IPO, LinkedIn evolved and gained greater recognition as more than a job seeker’s ghetto. Twitter continued to expand with new advertising options. 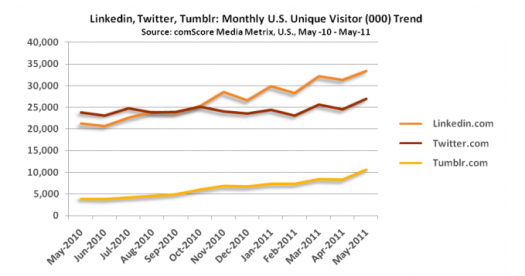 The surprise was Tumblr, a microblogging site whose sweet spot is teens and twenty somethings. Of course, the biggest marketing challenge on social media platforms is that consumers want to interact with their family and friends not brands. Actionable Marketing Tip: Monitor the social media ecosystem to determine what’s being said about your organization so that you can respond quickly and effectively. Also, create a social media marketing plan. Target your core prospects and develop strategies that are aligned with your business goals. Authority matters. With the growth of Klout and other forms of social media services to assess individual authority and reach across platforms, there’s increased focus on tracking social media influence. While each tool has its forte, the challenge remains integrating online and offline influence. For example, Justin Bieber’s Klout is 100, the highest score, and President Obama’s Klout is 86. I’m not sure what you think of this comparison, but there’s a problem. Actionable Marketing Tip: Determine who the important influencers in your segment are and build relationships with them. Content marketing expands. As fuel for social media and lacking the upfront sell, sell, sell of most advertising, content marketing helps achieve marketing goals of building brands, attracting new customers and closing sales. Actionable Marketing Tip: Build an editorial calendar to ensure that you’ve have tailored content at every step of the purchase process across marketing types and content formats integrated with your promotions and your marketing plan to achieve your business goals. Content continues to become digitalized. Like music, e-book sales continue to surpass hardcover and paperback versions, changing how and where we purchase content. E-book only bestsellers are starting to emerge. Concurrently, print media consumption, specifically newspapers and magazines, continues to decline. Actionable Marketing Tip: Leverage new forms of digitized content to support your marketing efforts. Also use digital media to build your product offering and content marketing. 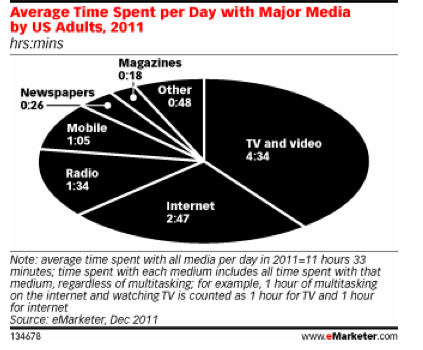 Television still remains part of the consumer content mix. Television viewing, whether it’s live or recorded on a DVR or DVD, increased 10 minutes from 2010 to 4 hours and 34 minutes each day watching TV and video on a traditional television set for an average adult consumer. With increased concurrent use of devices like smartphones, tablets (mainly iPads), e-readers, and gaming consoles, consumers often use multiple screens at the same time. Actionable Marketing Tip: Ensure your mobile site is available when your prospects and customers are. Provide content they can read on the go. Also make sure they can find quickly find your mobile website or information when the inspiration strikes such as a television show or advertisement. 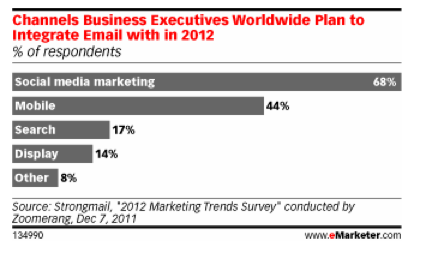 Don’t tell anyone but email’s stronger than ever. While discussing email can be a marketing no-no, the reality is that email rules. Unlike social media platforms where a Like or a Follow doesn’t necessarily mean you can communicate with fans, email still delivers your message cost effectively. Further, it’s social media’s communications glue that drives participants. Actionable Marketing Tip: Build your email house file. Offer prospects an incentive to capture their email address. 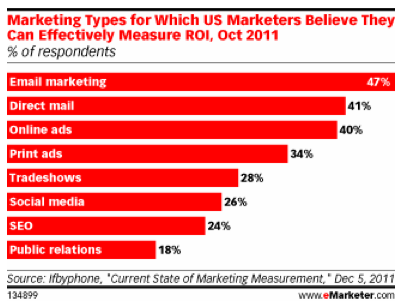 Search remains an important element of marketer’s budgets. Web-based search still works and continues to evolve. Further, mobile search’s critical for smartphone users since keypads are small and time is of the essence. Actionable Marketing Tip: Make sure that your search marketing budget still delivers quality traffic that converts. Also, ensure your organization is findable on mobile search for on-the-go users. Metrics matter more than ever. With today’s tighter control over marketing budgets, it’s critical to prove every marketing investment yields a positive return. That said, many marketers still have difficulty tracking results even for mature options like direct mail, print ads and tradeshows. Actionable Marketing Tip: Plan for success by determining appropriate metrics when you create your marketing strategy. Don’t forget to use a call-to-action and a tailored promotional code. 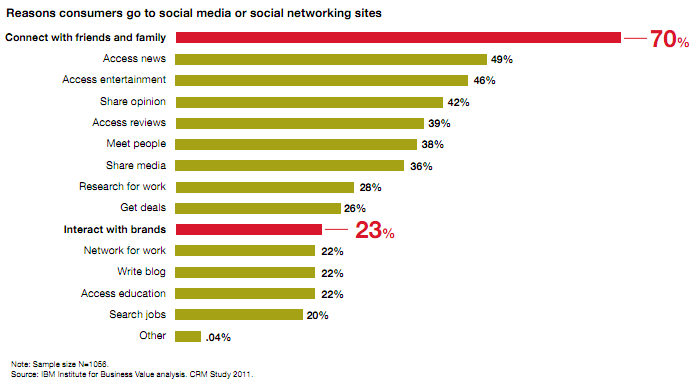 As 2011 proved, marketing continues to evolve in a dynamic economic and social media connected world. You must make sure that your marketing efforts are measurable and continue to change with the market to remain effective. What else would you add to this list of 2011 highlights and why? Tags 2011 highlights, Actionable Marketing Tips, Charts, Research. Bookmark the permalink.